This sale was scheduled for Friday and until Saturday at noon but a funeral on Saturday moved the sale up a day so that it began the same day as the Anglican sale. With these two sales occurring on the same weekend each year it is interesting to see how similar and how different the two events can be. 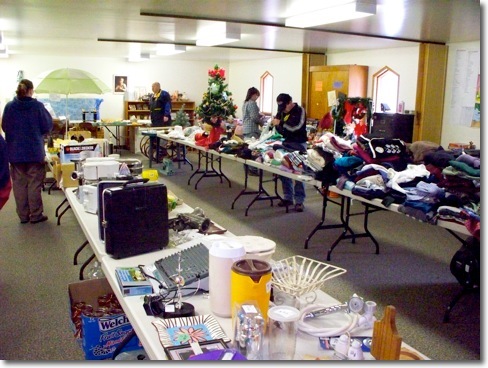 In both cases there are always a large amount of clothing but this year the Lutheran sale has a lot of really big items. Two kitchen table and chair sets, patio furniture, an automobile shop jack and a lot of high quality kitchen appliances. Take a look at the sample of pictures on the "picture" page to see some of the items that caught my eye.